Thank you for your review, Alexis! 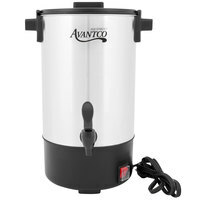 We are sorry this Avantco CU30 30 Cup (1.1 Gallon) Stainless Steel Coffee Urn has not worked well for you. A Customer Solutions Representative will contact you soon! I am not happy with this product. The outside of the urn is SO HOT! The insides our cheap plastic. It looks nice is the only positive I can give it. Also because we used it once we cant return it, so I am out the money. DONT waste your money! Thank you for your feedback! We are sorry you did not prefer this urn; for recommendations please contact our Customer Solutions team! This coffee urn started out great but then it died. It started off with a small leak from the hot water trickling down the side of the unit. I thought nothing of it but over time the leak was damaging the heating assembly at the bottom. Finally after operating for a few weeks the switch stopped working and we called customer service and it was all taken care of. Really happy with the team at Webstaurant store for being so attentive and helpful (customer service gets 5 stars lol). Thank you for your review, Frenny! We are sorry this item was defective, your account has been credited! We have acknowledged the issue with the coffee urn leaking and have corrected this problem. I bought this urn to keep hot water available for us it to make other drinks like tea. It keeps the water good and hot and it has a sufficient capacity to last through long time, when we can't refill it. I bought this to use for our wedding reception and we have been able to use it at several other events. It is easy to set up and clean, and keeps our hot beverages the perfect temperature. Great Purchase! One of my favorite all time products. This works great. Coffee is always hot and we never run out. I would also suggest the insulated thermal servers to accompany this. Bought this for my church for our monthly luncheons, and it has really worked well, The only reason I am subtracting a star is the fact that this doesn't have a basket for grounds, which seems to be something that should be included. Great item! Keeps our water warm for our mocha's and works great. Easy and functional and just the right size for my ice cream and coffee shop . I performed extensive research looking for an attractive way to provide beverage service for my customers. I am absolutely satisfied with choosing this product. Not too happy about the way they arrived and one was damaged, The rep I spoke with regarding the damaged product and how it was shipped did her job as expected. Nevertheless, this is the perfect item for what I needed. Good job! I am so excited to finally have a coffee urn. Thisnis going to come in handy for parties. No more making 4 pots of coffee. Looks real nice in person as well. We are a family owned Frozen Yogurt business who have started serving Boba Tea. The Coffee Urn are a perfect size and work great to keep our tea warm. We use this coffee urn mostly for hot water to make hot cocoa. Also brews a great batch of coffee when we need that for catered events. The water heats very quickly and stays very hot. The only draw back is that the spout is very low on the urn where we have to set urn on stand in order to use our 12oz disposable coffee cups. Works awesome, just as we thought. It holds a lot of fluid and keeps it warm for a while. It is a little louder then I thought it would be. The avantco 30 cup coffee urn is working out great for me. It matches my kitchen appliances. It's very easy to use and very large. Perfect for all the gatherings I host through out the year.